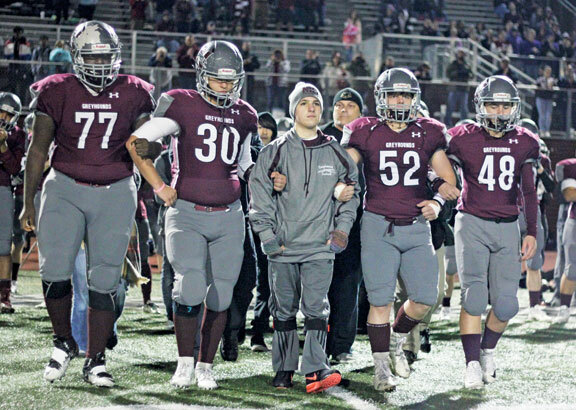 NAUGATUCK — In the eyes of Naugatuck’s Avery Moore, it was always a matter of when, not if, he would walk again. Two months after sustaining traumatic injuries during a car accident, the 15-year-old’s determination and grit was on display Oct. 26 for everyone to see. Moore showed everyone how far he’s come by walking out to the middle of Veteran’s Field to perform the pregame coin toss before Naugatuck High’s football game with Crosby. Moore walked without the assistance of a walker or wheelchair, although he wears leg braces to secure his balance. Tommy Moore, Avery’s dad, said his son still has numbness in his feet and hands. Back on Aug. 1, Moore sustained a rupture of the fifth cervical vertebrae in his neck during a car accident in Long Island. He had emergency surgery to remove bone fragments and also needed spinal cord fusion surgery. The surgeries were performed at Stony Brook University Medical Center. Weeks later, Moore was transported to Gaylord Hospital in Wallingford for rehabilitation. After extensive rehab, he was released on Sept. 30. Currently, Avery attends out-patient physical therapy and occupational therapy three days a week at Gaylord and is being home-schooled twice a week. Two weeks after being released from Gaylord, Avery, a triplet, celebrated his 15th birthday on Oct. 14 with his brothers Brody and Casey. According to his dad, Avery’s positive attitude has made a huge difference in the healing and recovery process. Tommy Moore said Avery’s progress has been posted regularly on the Moore Facebook page. Avery’s mom, Becky, said the support from people in the borough with various fundraisers and donations and well-wishes has been more than she could ever have imagined. That included heartfelt support from his fellow students. In late September, members of the high school’s DECA chapter organized “All Night for Avery,” a walk-a-thon to raise money to help Avery. The Greyhounds football team also stepped forward to help. Even though Avery is an aspiring artist rather than a member of the football team, the Greyhounds raised nearly $2,500 during a car wash for the Moore family in mid-September. The team also visited Avery at Gaylord. Linton’s son, Nicholas, is a sophomore on the football team. Sollazzo said the Greyhounds were glad to come to the aid of one their classmates.